Dave Bagdade is an award-winning mandolin player and an experienced educator, having performed and taught at workshops all over the US and Canada. He began playing Irish music after hearing The Chieftains at the age of 16, and he has been a member of the Murphy Roche Irish Music Club for more than a decade. He is a three-time gold medalist at the Midwest Fleadh Cheoil, and he has competed at the Fleadh Cheoil na hÃireann in Ireland. In addition to performing regularly as a solo artist and with The Cousin Brothers and the New Trad Ramblers, Dave teaches mandolin, guitar and tenor banjo at the beginning and intermediate levels. 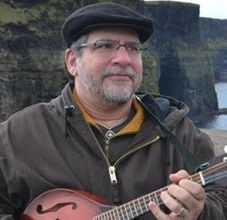 Dave is the host and producer of the Kitchen Party Ceilidh, a Celtic-music radio program based in Indianapolis and has released three albums of original music, with the fourth scheduled for 2015. For more info on Dave see his website.